sterling silver oxidised bead cap width 9mm x 2.3mm .Ideally suited to beads around 12mm round. unmarked soilid sterling silver. 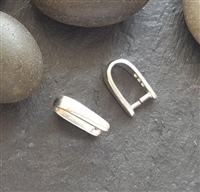 8x2.5mm sterling silver bail with openable ring (2 pcs) marked with a small 925 on top of bail. © Copyright 20165 Eternalflow. All Rights Reserved.